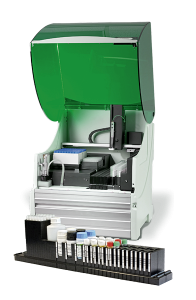 Fully automated two plate ELISA Analyzer. The SQII is pre-programmed and validated to run all AESKULISA® test kits developed and manufactured by AESKU.DIAGNOSTICS. Equipped with the AESKULISA® custom-made rack, you no longer have to transfer standards and reagents into new unlabelled vials. By combining the SQII ELISA analyzer with AESKULISA® test kits you can maximize your automation efficiency while saving hands-on time and costs in unnecessary needed consumables. The SQII was designed for efficiency and reliability. The system has only few moving parts, one multi-functional robot arm does everything: from pipetting to operating the barcode reader. Versatile and truly innovative in its process simulation and ease of use, the SQII software allows the integration of automation in your lab with confidence. The simple, graphical interface enables every lab technician to use SQII with minimal training. The assay creator, with its drag-and-drop icons, walks you through the entire programming process, prompting you step by step, making set-up of your assays a breeze. Did you miss a critical process step? SQII will let you know before you can move on. 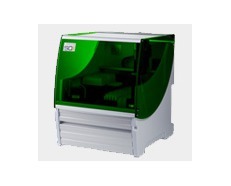 Designed as an open system, the SQII is capable of processing virtually any ELISA application – From clinical diagnostics, such as autoimmune and infectious disease, to food safety and drugs-of-abuse testing.